Well, there’s no sugar-coating it, labour hurts! This you have no control over. However, how you choose to minimise and cope with this pain is something that remains firmly within your grasp. As a mother, you will always want what’s best for your child, to protect them in any way you can. This begins before you even set eyes on your newborn baby. There is now a tiny little life that depends upon you for everything, even the oxygen and food essential for their survival. So it is understandable why many mums-to-be opt for a natural/drug-free form of pain relief during labour. You will have almost certainly heard the term ‘epidural’ before. The idea of having an epidural has most soon-to-be mums running for the hills. Similarly the idea of being injected with all manner of drugs can be quite off putting, especially when you have a little one to think about. In worst case scenarios an epidural can result in a prolonged second stage of labour and increase the risk of having an instrumental delivery (with forceps or ventouse). Other drugs can make it difficult to push, and if administered too close to birth could affect the baby’s breathing. Regardless of how prepared you are, as soon as you go into labour, panic will undoubtedly ensue. It is important to try and remain calm; a feat sometimes easier said than done! Do what you can to ensure that you are in a relaxed environment and feel completely comfortable. You may want to try listening to calming music, having a back massage from your partner, or even burning some essential oils (check suitability during pregnancy). Do try to remain mobile though; walking around not only eases the pain of contractions, it can also speed up labour itself. Remember all of those helpful tips you learnt in antenatal class? Well, it won’t be long before your knowledge is being put to the test. Don’t tell me you weren’t listening when they were teaching those all-important breathing techniques? Approximately one in five women will use TENS (transcutaneous electrical nerve stimulation) to help them through the early stages of childbirth. Designed to block the pain signals sent to the brain, whilst stimulating the release of endorphins (the body’s own natural painkillers), a TENS machine also offers a welcome distraction from the trials and tribulations associated with labour. This is achieved by a gentle electric current passing through the body, between electrodes placed on your lower and mid-back, and will feel like a soft massaging buzzing against the skin. Although less effective during established labour, using TENS for as long as practical can stave off and reduce the risk of a drug assisted birth. In addition, going through the early stages of labour without any pain relief can be tiring and diminish the ability to cope with pain during the latter stages. It is certainly a good place to start, and can be combined with other forms of pain relief, including entonox (gas and air), to create a dual barrier against pain. Although Labour TENS machines remain a popular choice, they are becoming less readily available in hospitals up and down the country. As women are no longer admitted until the active stage of labour, many hospitals are choosing to invest in alternative forms labour pain relief. Because of this very fact, it has become quite common for women to purchase their own TENS machine prior to going into hospital, which means the pain and discomfort can be eased from the very first contraction. It is highly unlikely that any new mum goes into childbirth with an epidural or drugs as their first choice of pain relief. However, things don’t always turn out as planned. Don’t put yourself under too much pressure, you’re only human! Regardless of your intentions, unforeseen circumstances may make drug free labour impossible. Remember; it will be worth it in the end! You’ll be handed your little bundle of joy and the pain will become a distant memory. Knowing your options is half the battle, so we hope this article has, in some way, helped to give you a greater understanding. 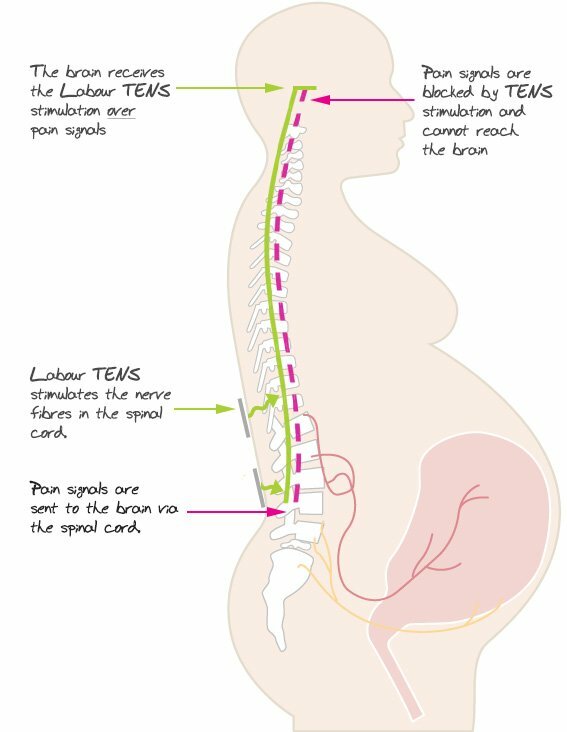 If you’ve decided that TENS pain relief in labour is something that you want to try, we have just the product for you! The revolutionary Kegel8 Mother Nurture Pelvic Floor Toner and Labour TENS is not only designed for strengthening the pelvic floor before and after childbirth, it also doubles as a TENS machine for labour itself. The device comes with two attachments, a probe for strengthening the pelvic floor and electrode pads for TENS pain relief during labour. A boost button will help you to stay in control of your pain relief, and ensure that you get a ‘boost’ as and when required.